On Wednesday, December 5, 2018, at approximately 1:45 PM, the Sheriff’s Office received information from Texas Department of Family and Protective Services (DFPS) that suspect Johnathan Samuel Young, DOB: 080662, had removed his child out of a hospital in Texas against medical advice. It was believed Young was holding the child and other family members against their will at a Value Inn located in the 6800 block of Space Village Avenue. Young made statements to DFPS that he “would not be taken alive” and was considered armed and dangerous. Members of the Sheriff’s Office responded to the address and were able to take suspect Johnathan Young into custody without incident. The child was found safe and unharmed. Other family members were transported to a local hospital for evaluation. Johnathan Young was transported and booked in the Criminal Justice Center Jail on Felony Fugitive from Justice, Third Degree Assault, Harassment, and Child Abuse as well as an outstanding Felony Warrant out of Texas for Assault. Additional charges are pending. 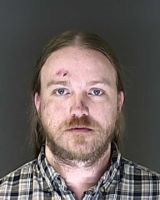 A mugshot of Young is attached to this Media Release.